O'Hana Gallery, London (no. 1260). Acquired from the above by the family of the present owner in 1966. D. Sutton, 'A diamond as big as the Ritz', in Apollo, vol. XCIII, no. 107, January 1971, p. 40 (illustrated pl. 6; titled 'Kiki de Montparnasse'). London, O'Hana Gallery, Summer Exhibition of Paintings and Sculpture of the Nineteenth and Twentieth Centuries, May - September 1966, no. 45 (titled 'Le chapeau bleu, Kiki de Montparnasse'). Tucson, The University of Arizona Art Museum and Kansas City, Nelson Gallery, Atkins Museum, Cornelis Theodorus Marie Van Dongen, 1877 - 1968, 1971, no. 53, p. 182 (illustrated p. 73; titled 'The Blue Hat Kiki of Montparnasse' and dated '1905'). To be included in the forthcoming Kees van Dongen catalogue raisonné being prepared by Jacques Chalom des Cordes under the sponsorship of the Wildenstein Institute. Surrounded by the rich and deep blues and reds of her clothing and the background, the pale features of the woman in Le chapeau bleu themselves are filled with a light and warmth that makes them flame-like. Painted circa 1910-12, this picture dates from the end of Van Dongen's Fauve period, as is already evident in the fact that the picture itself is relatively dark. Yet this darkness retains the life and richness of Fauvism, with the rich claret background, the orange at the centre and the blues-- ranging from Prussian Blue to lapis-- packed with an intensity that is heightened by the fact that they have been applied essentially untrammelled and unmixed. Van Dongen is showing his continued primary interest in colour, rather than the focus on pictorial structure that would come with his imminent interest in Cézanne's pictures. It is this virtuoso colourism that is evident in the flash of red in the woman's hair, which is itself picked out by the red in the background. Likewise, as though in a tribute to the paintings of his friend and fellow Fauve artist Henri Matisse, Van Dongen has used green in order to articulate the areas of shade and shadow of the woman's face, an effect that is made all the more dramatic through the contrast with the swathes of deep, wine-coloured red in the background. In particular, this recalls Matisse's celebrated portrait of his wife which was often referred to as La raie verte precisely because it used a green band to define the shape and shading of the face. Matisse had not been one of the pioneers of the Fauve movement-- he was already an older and more established artist by the time he met Derain and Vlaminck-- but it was his endorsement that led to its success and recognition, and he remained a touchstone for the other painters who found themselves, at one point or another, grouped under the umbrella term of Fauve. During the period that Le chapeau bleu was painted, Van Dongen's paintings of women often depicted the various characters of the Parisian demimonde. Even in some of his paintings of his wife Guus, he would choose to depict her as though she too were part of the marginal, rakish, decadent world of entertainment, cabaret and prostitution that filled so many of his works. 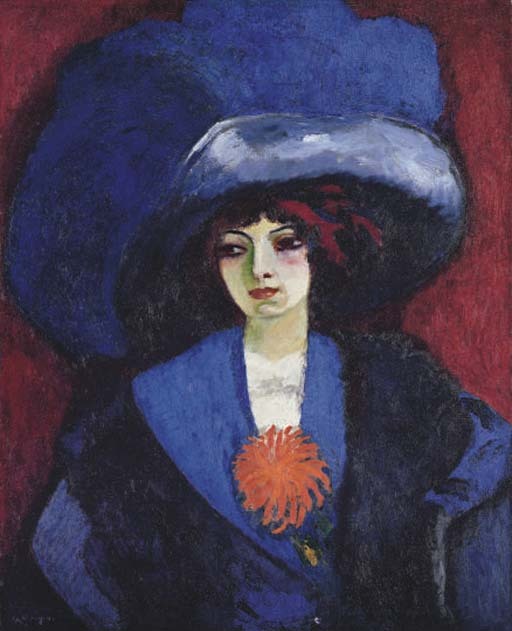 It is a reflection of the degree to which Le chapeau bleu appears to fit within this context that it has been exhibited with an additional title claiming that the subject is 'Kiki de Montparnasse.' The rich colours in this picture, as well as the extravagant clothing, hint that this may indeed be one of the dancers or other women of this infamous section of society. This was a subject matter that had long fascinated the artist, as was evident in the first works that he executed on his arrival in Paris, often focussing on the seamier side of the nightlife in the French capital. In this, Van Dongen had been treading in the footsteps of Toulouse-Lautrec and Steinlen, but with his bold Fauve colours, he took these themes to a new level. The colours in Le chapeau bleu are a feast for the eyes. The skin tones, thrust into such bold relief by the contrast with the background, emphasise the flesh of the woman, while the luscious depth of the colours in general introduce a sensuality and even a decadence that is wholly absorbing. It is telling that, in his preface to an exhibition of Van Dongen's paintings, the critic Louis Vauxcelles quoted the poet Guillaume Apollinaire, who had said that these works, 'smelt of opium, ambergris and eroticism' (Apollinaire, quoted in W.E. Steadman & D. Sutton, Cornelis Theodorus Marie van Dongen 1877-1968, exh.cat., Tucson, 1971, p. 38). This description is particularly apt for Le chapeau bleu, in which the clothing and the background become almost hazy around the face, perhaps implying a sense of swirling intoxication as well as our introduction to a velvet-lined world of sense. For the Fauve artists, intense colour was a means of conveying-- and evoking-- emotions and feelings as well as simple spectacle. Le chapeau bleu is not merely a portrait, but is an insight into the life of the artist that conjures up a world of desire, of sexuality. In a sense, the Fauves were exploring a similar territory to their contemporaries among the German Expressionists, and it is therefore no surprise to find that in 1908, Van Dongen was invited to exhibit alongside the Dresden-based group, Die Brücke. This had followed his making the acquaintance of Max Pechstein during the latter's trip to Paris the previous year. The Brücke artists featured that same year in Van Dongen's correspondence, when he referred to their first exhibition, although he somewhat ungraciously termed them 'boches,' a deliberately teasing act of provocation considering the letter was addressed to his dealer and another German Daniel-Henri Kahnweiler (see M. Leuba, 'Van Dongen et l'Allemagne 1908-1966,' pp. 216-19, Van Dongen, Le Peintre 1877-1968, exh.cat., Paris, 1990, p. 216). That this was only a mockingly disparagingly comment was demonstrated by the fact that Van Dongen exhibited alongside these 'boches' several times in the forthcoming years. Looking at the paintings of his German contemporaries, it is easy to see the similarities that led to this interaction and interest between the two groups. Several of Kirchner's paintings in particular bear similarities, in terms of colour, composition and theme, with Van Dongen. This perhaps shows more of a flow of ideas and inspiration than is usually accorded. However, there is a difference in tone between Van Dongen and the works of these German painters. One difference lies in the fact that the Paris-based painter, unlike even his own fellow artists in Paris, showed little interest in the 'primitives,' in the tribal, in other ways of seeing, instead focussing on an intense yet sophisticated means of representing the sophisticated inhabitants of a sophisticated though decadent section of society. Crucially, Van Dongen also showed none of the brooding atmosphere or the cynicism of some of the Expressionists' works. Instead, his paintings remain celebrations of the world of Paris at night, revelling in depicting the beautiful women, beautiful clothes, indulging, and inviting the viewer to indulge, in the sensual world of entertainment, eroticism and enjoyment. Please note this work will be included in the forthcoming Kees van Dongen catalogue raisonné being prepared by Jacques Chalom des Cordes under the sponsorship of the Wildenstein Institute.